In the second half, Luis Suarez scored twice in the 51st and 71 minute to tie and give Barcelona the lead before Messi delivered the final blow with an unforgettable free kick. Barça will now shift their attention to the first leg of their Copa del Rey Quarter-Finals clash on Wednesday before hosting Real Betis on Sunday. They still remain league leaders with 51 points and a 9 point cushion ahead of Atletico Madrid. REAL SOCIEDAD: Rulli, Odriozola, Llorente, Raúl Navas, Kevin Rodriguez, Illarramendi, Canales, Xavi Prieto (Januzaj, 78′), Zurutuza (Zubeldia, 56′), Juanmi (Oyarzábal, 60′) & Willian José. FC BARCELONA: Ter Stegen, Sergi Roberto, Piqué, Vermaelen, Jordi Alba, Busquets, Rakitic, Iniesta, Paulinho (Dembélé, 65′), André Gomes (Digne, 80′), Messi & Suárez (Denis, 90′). 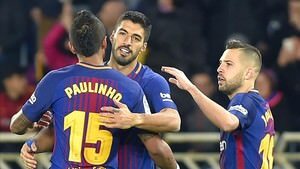 Goals: 1-0, Willian José (11′); 2-0, Juanmi (39′); 2-1, Paulinho (39′); 2-2, Luis Suárez (51′); 2-3, Luis Suárez (71′); 2-4, Messi(85′). Cautions: Ilarramendi (63′), Oyarzábal (84′)/Roberto (60′), Piqué (90′). Previous PostBarça crush Celta Vigo 5-0 in return leg of Copa clash. Next PostBarça battle Atletico Madrid for a 1-0 victory.